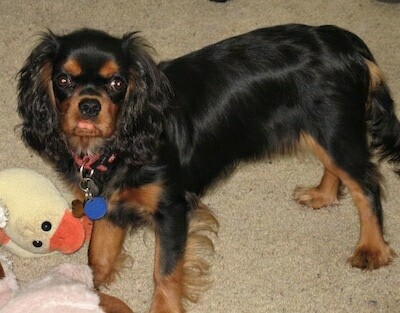 Daphne the Cavalier King Charles Spaniel at 3 years old— "She has the Blenheim spot on the top of her head. Her favorite things to do are kiss, cuddle and go on runs with our other dog Raven, an Australian Shepherd." A Blenheim spot is a spot in the middle of the crown of the head. It is also sometimes called "the kiss of Buddha" or "Kissing Spot." The Cavalier King Charles Spaniel is a well-proportioned little dog. The head is slightly rounded, the muzzle full, tapering a little with a shallow stop. The nose is black. The teeth meet in a scissors bite. The dark brown eyes are round and set well apart with dark eye rims. The long ears are set high with abundant feathering. The topline is level. The tail is sometimes docked by 1/3, but is usually left natural. Dewclaws may be removed. The silky coat is medium in length with feathering on the ears, chest, legs and the tail. Colors include tricolor, black and tan, blenheim (red and white) and ruby (rich mahogany red). The Cavalier King Charles Spaniel is an eager, affectionate and happy dog, always seeming to be wagging its tail. Outgoing and sportive, these fearless lively little dogs are eager and willing to please. They are intelligent enough to understand what you want and therefore are usually easy to train and respond well to gentle obedience training. They are said to be naturally well behaved and get along well with other dogs and non-canine pets. 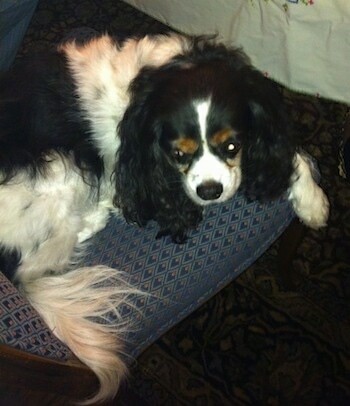 Cavaliers love people, enjoy companionship, and need rules to follow and limits to what they are allowed to do. They are not suited to kennel life and should not be left alone all day. If you do need to leave them, be sure to take them for a pack walk before you leave to put them in a natural rest mode. Do to their hunting background they have an instinct to chase. Do not allow this sweet dog to develop Small Dog Syndrome, human-induced behaviors where the dog thinks he is pack leader to humans. This can cause a varying degree of behavior problems, which are not Cavalier traits, but are brought on by the way they are being treated. They are recommended with older considerate children, simply because most small dogs are treated in such a way they start to believe they rule the home. In addition to being the dog's leader, socialize well to avoid them being reserved with strangers. The Cavalier King Charles Spaniel is a pleasant companion dog. They have remarkable eyesight and sense of smell and can be used in short hunts in open country. They do well in competitive obedience. Prone to syringomyelia, hereditary eye disease such as cherry eye, dislocating kneecaps (patella), back troubles, ear infections, early onset of deafness or hearing trouble. Sometimes hip dysplasia. Don't overfeed. This breed tends to gain weight easily. Also prone to mitral valve disease, a serious genetic heart problem, which can cause early death. It is wise to check the medical history of several previous generations before choosing your puppy. Cavalier King Charles Spaniels are good for apartment life. 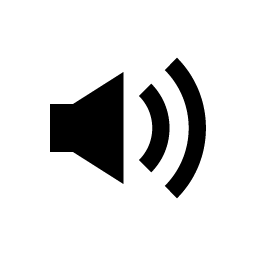 They are moderately active indoors and a small yard will be sufficient. The Cavalier does not do well in very warm conditions. 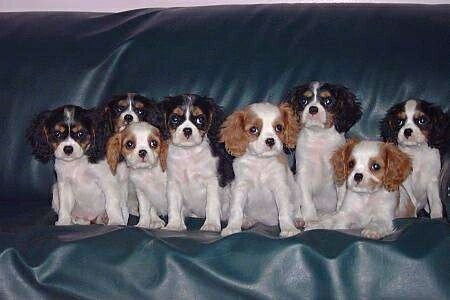 Cavalier King Charles Spaniels need a daily walk. Play will take care of a lot of their exercise needs, however, as with all breeds, play will not fulfill their primal instinct to walk. Dogs that do not get to go on daily walks are more likely to display behavior problems. They will also enjoy a good romp in a safe open area off-lead, such as a large, fenced-in yard. Comb or brush with a firm bristle brush, and bathe or dry shampoo as necessary. The hair between the pads on the feet needs to be trimmed. Prone to tangling and matting on the ears, and should be brushed often. Clean the inside of the ears regularly. Always make sure the dog is thoroughly dry and warm after a bath. Check the eyes carefully for any signs of infection. This breed is an average shedder. Named for King Charles II, the Cavalier King Charles Spaniel is descended from the King Charles Spaniel. 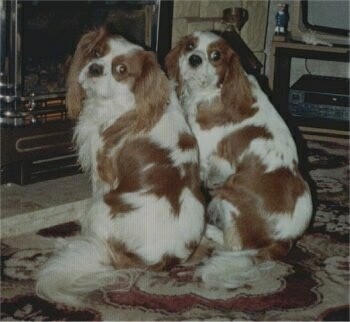 In the late 1600s the King Charles Spaniels were interbred with Pugs, which resulted in a smaller dog with flatter noses, upturned faces, rounded heads and protruding eyes. The consequence of this breeding is what we know today as the King Charles Spaniel (English Toy Spaniel).In the 1920s an American named Roswell Eldridge offered prize money during a Cruft's Dog Show in London to any person exhibiting King Charles Spaniels with long noses. He was looking for dogs similar to those appearing in Van Dyck's paintings of King Charles II and his spaniels, before the Pug was bred in. A dog called Ann's Son, owned by Miss Mostyn Walker, won the Eldridge prize, however Eldridge had died a month before the show opened and was not there to present the award. His ideas lived on in American breeders. The Cavalier King Charles Spaniel breed, as we know it today, is the product of the American breeders of the late 1920s, though this 'modern' breed is the true heir of the royal spaniels of King Charles II. By the 1940s these dogs were classified as a separate breed and were given the prefix Cavalier to differentiate them from their forebears. 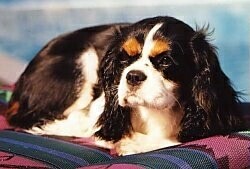 The Cavalier King Charles Spaniel was shown in the Toy Group of the AKC beginning in 1996. 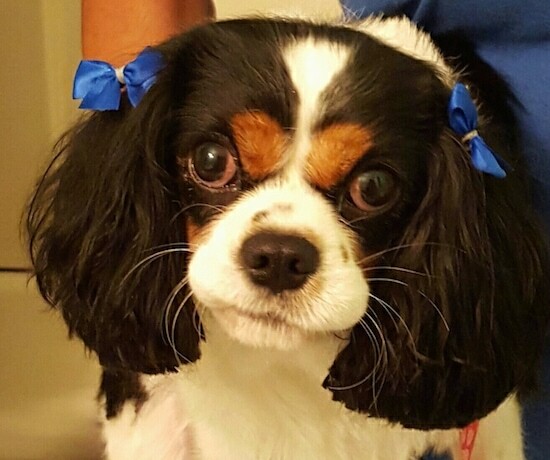 Paris the tricolor Cavalier King Charles Spaniel at 2 years old—"Paris is a very loving dog. No one is a stranger to her. She enjoys playing with children and running around the back yard. Her favorite sleeping toy is a lamb, which she received as a Christmas present." 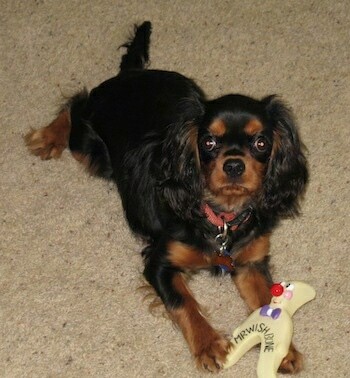 Boz the Cavalier King Charles Spaniel at 7 months old—"This is Boz carrying around his favorite toy when he was a puppy. Boz is now an adult and is such a great companion. Boz enjoys going for walks and going for car rides. But above all, his favorite thing to do is to meet humans! He isn't really fond of other dogs, except for the other 3 dogs we have. When Boz was a little over a year old, we got a Shih Tzu, Molly, because we noticed Boz wanted a friend to play with. He couldn't have been happier! Boz is a great cuddler and a very loyal companion." Boz the Cavalier King Charles Spaniel at 7 months old—"This is Boz carrying a treat in his mouth." 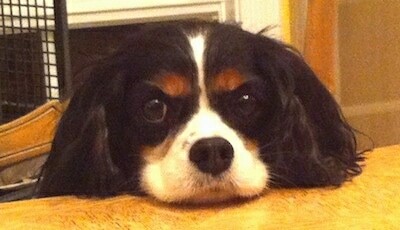 "Tessie is a 2½-year-old Cavalier King Charles Spaniel. 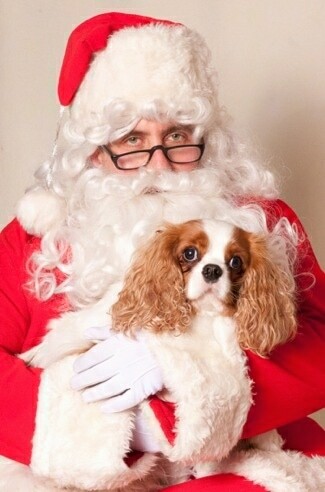 Her Christmas picture was taken to raise money for vet care for homeless animals at Old Derby Animal Hospital in Hingham, MA. Tessie loves attention and loves people of all ages. She loves going to Pawz Rules Doggie Day Care why we are working to play with other dogs less than 25 lbs. On weekends she loves walking with us at Castle Island in South Boston or the Boston Common in downtown Boston meeting new people, meeting new dogs and just running around. She especially loves meeting and kissing young children who come over to pet her. Tessie loves resting on the couch as close as possible to us and even likes watching the Dog Whisperer with us. She likes to bark at the other dogs she sees on TV. We met Tessie shortly after she was born and being big Red Sox fans, named her after the Dropkick Murphy's song “Tessie" which was played at Fenway Park during the 2007 baseball season. Tessie doesn't have a mean bone in her body and is the PERFECT PET." This is Charlemagne and his litter of 7 brothers and sisters. Charlemagne is the first pup on the left. Danny and Ben (father and son)—after their bath they are both sat by the fire drying themselves. 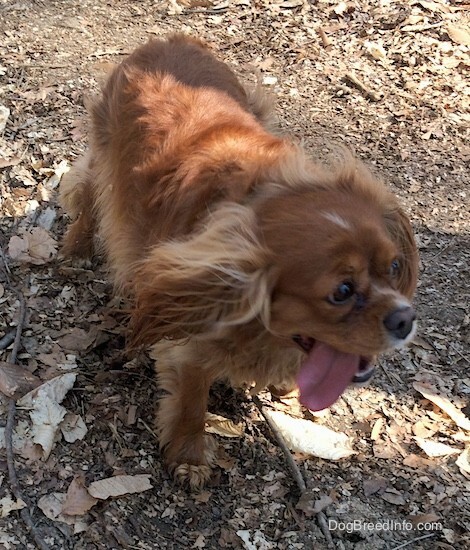 Poppi the ruby Cavalier King Charles Spaniel on the run on a hot summer day.